If you’re planning a trip to Cuba, there are a few things you’ll need to know before booking your flights and heading to this place which seems to be frozen in time. One of the most important things to consider is the dual currency that the country adopted shortly after the fall of the Soviet Union. Originally the government had only National Pesos (CUP or moneda nacional in Spanish). After 1991 they were using the US dollar as their second unit of finance, until 2004 when they introduced the CUC (Convertible Peso) or “kook” as it’s commonly referred to by locals. The CUC is pegged to the US dollar which seems paradoxical as the US has held a trading embargo against Cuba since 1960. It’s no surprise then that the CUC is a confusing and sometimes frustrating aspect of travelling in Cuba, but it is something that you should understand before visiting the country. What is the CUC Used For? If you’re travelling in Cuba, you will be spending almost exclusively CUC. This is the currency you’ll need to pay your bill at a restaurant, pay for your hotel, buy souvenirs and purchase beer at the store. For locals, the CUC represents their ticket to small luxuries that make living in a strictly socialist country more comfortable. They’ll hustle and work hard to try to get a few extra CUC so they can buy themselves cigars, booze, food from a grocery store and restaurant meals. The dual currencies mean that Cubans who are lucky enough to work with tourists will likely have a huge financial advantage over their government employed amigos. What is the CUP Used For? The CUP or National Peso is what Cubans are paid in. As the average wage in Cuba is around the equivalent of $25 USD / month, it’s no surprise that the items you can purchase with the CUP are very cheap for foreign visitors. There are Peso Food stands and small cafes that charge in CUP where you can pick up sandwiches, chicken dishes, pizza, refreshments and sometimes beer. The locals also use CUP to pick up their produce from the local markets and to buy fish from fishermen. To give you an idea of how inexpensive purchases can be with CUC for tourists, a 12″ cheese pizza with a tall glass of fresh guava juice probably won’t cost you more than 50 cents in Cuba. Despite the fact that you will be using mostly CUC while travelling in Cuba, it is still a good idea to carry around 250 CUP (About $10) in your pocket at all times so that you can take advantage of the great value food and drinks when you have the opportunity. To get CUP you’ll simply have to head into a Cardeca and exchange either your foreign currency or your local CUC. At first glance, you may not notice the difference between the CUC and the CUP. That is why it is important that you always check the change you are given back after making a purchase. A common and easy scam in Cuba is simply giving change back in CUP instead of CUC. Basically, the CUC says “Convertible Peso” on the bill and they are different colors. Always look for those words on your bills and you should be fine. Below is a photo to help you see the difference. 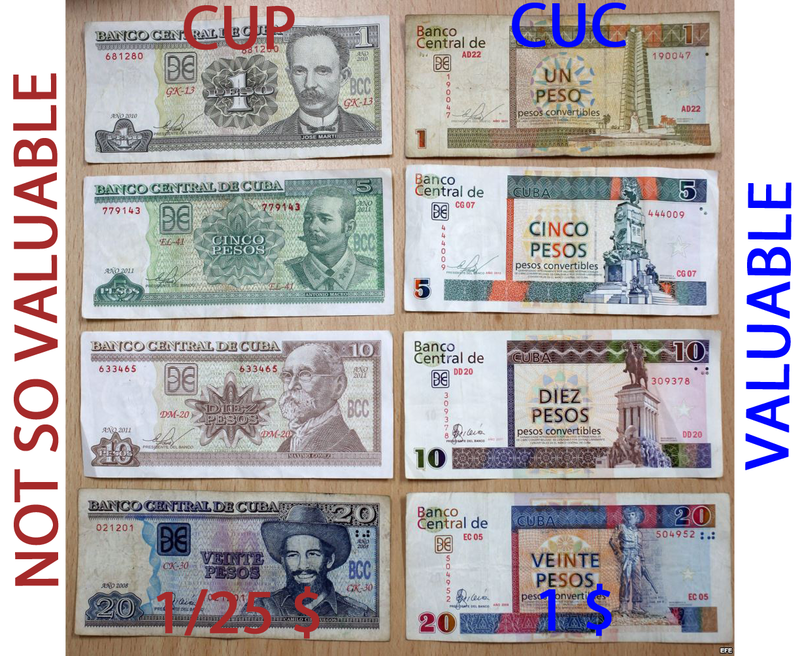 Both the CUC and the CUP are completely useless outside of Cuba so it is important that you convert your leftover CUC and CUP back to Canadian dollars before leaving the country. Luckily the Havana airport has numerous 24 hour money changers both before and after immigration, so you should have no problem ridding your wallet of the valueless money before departing Cuba. In Mid-October of 2013, the Cuban government announced that they will be getting rid of the dual currency system to try to help restore value to the Cuban Peso and hopefully to Cuba’s economy, which is currently in collapse. They explained that it would be a slow process, which has proved true as now, nearly 2 years later, the strange system is still working the exact same way that it did before 2013. Of course, with relations softening between Cuba and the US, the entire nation is in a state of anticipation for change, and the currency system will probably be no different. We would expect that the 10% levy on US exchange in the country will disappear and perhaps the US dollar may be restored as Cuba’s second currency. But who knows. Cuba is a fascinating place that is full of surprises, and while travel here is exhilarating, trying to convert two currencies in your wallet can be trying at times. We recommend reading over this article before you head to Cuba. Have a second pocket in your wallet reserved for CUP so that you can spend both currencies freely. The last thing you want to do is buy peso food with CUC and pay 25 times the actual price! As long as you’re conscious of the money that’s in your wallet, you should have no problem while you’re in Cuba. Enjoy! There are Peso Food stands and small cafes that charge in CUP where you can pick up sandwiches, chicken dishes, pizza, refreshments and sometimes beer. The locals also use CUP to pick up their produce from the local markets and to buy fish from fishermen. To give you an idea of how inexpensive purchases can be with ??CUC?? for tourists, a 12″ cheese pizza with a tall glass of fresh guava juice probably won’t cost you more than 50 cents in Cuba. think the article means how inexpensive purchases can be with CUP and not CUC right? Don't subscribe All Replies to my comments Notify me of followup comments via e-mail. You can also <a href='https://www.creditwalk.ca/comment-subscriptions/?srp=4166&srk=2648578ecea05c83754707575dc5a494&sra=s&srsrc=f'>subscribe</a> without commenting.